After my amazing week in Dubai, it's now time to fly again. Singapore here I come! I am seriously excited, not only do I get to see my daughter and spend some quality time with her, but it's also F1 time and I'm literally beyond excited about the fun that is about to commence in the next two weeks. I mean I always have the best time in Singapore when the Grand Prix is on. The night race is the only one in the world and half the men on the planet descend on Singapore for this awesome eventful weekend. As I step out of the airport I notice immediately that it feels cool. Hmmm, strange, it is never ever cool in Singapore as the temperature is a constant humid 30/32 degrees Celsius all year round. How was this possible? Arrr..... yes, of course, it feels cool after the intense heat of 40 C plus in Dubai. Wow, this feeling is definitely a first. I have arrived a week before it all starts but already I can feel that there is a buzz in town. The roads are all being closed off as they prepare for the big race and as the week goes on Singapore starts to fill up with men from all continents. Whilst out having a drink with my daughter on a Thursday evening we bump into some of the TV camera crew who are covering the whole event. They invite me to come and watch the race with them on Sunday as they will be at a prime location filming everything. This is just priceless these things always happen to me, I have not yet got my ticket for Sunday's race, so this is just perfect. 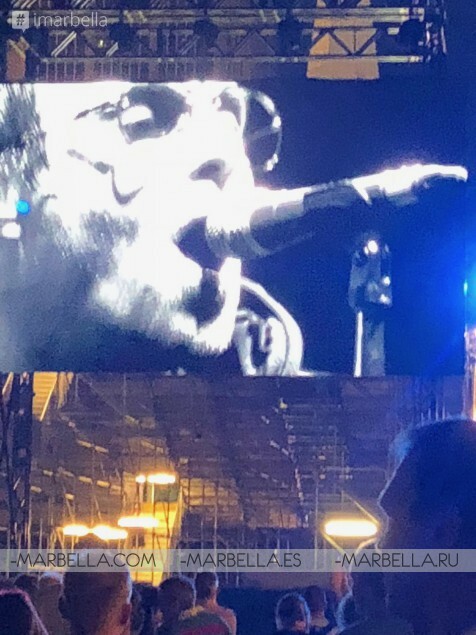 As I walk down to the track on Saturday, the music is blaring and I can hear Liam Gallagher pumping out the iconic 'Wonder-wall' from Oasis, A massive stadium is set up in the middle of the track and there are thousands of people just loving every second of it. "Baby........ you're gonna be the one that saves me........" I am singing at the top of my voice. The backdrop is mind blowing with the skyline behind. "Where am I, this is just awesome." Lewis Hamilton gets the best time in the qualifier and is set to win yet another Grand Prix. After the race, we celebrate as the whole city is in party mode. As I am dancing on the dance floor of some bar I see someone I recognize. Hmmm, where do I know this person from?" OMG, it is a Facebook friend from Marbella who I have never met. Hahaha. He is there totally smashed with some friends surrounded by some Singapore hookers. Hahaha, by the way, is totally the norm here. This world is so very small, he recognizes me and immediately comes over to give me a hug. It is all going off and the place is jumping as everyone parties the night away. I have to find out where I am watching the race with my new TV friends. "Come to the Swiss hotel at 8 O'clock." They text me. Why Yes, of course, it had to be the Swiss Hotel as it is right on the track. As I walk into the room the cameras are all on the balcony and I have to be quiet and not say a word as it is live TV. OMG the roar of the cars on the track below fills me with excitement and the view takes my breath away. "WOW," I say silently to my cameraman friend who is filming everything. This is truly one of the most amazing surreal moments in my life. 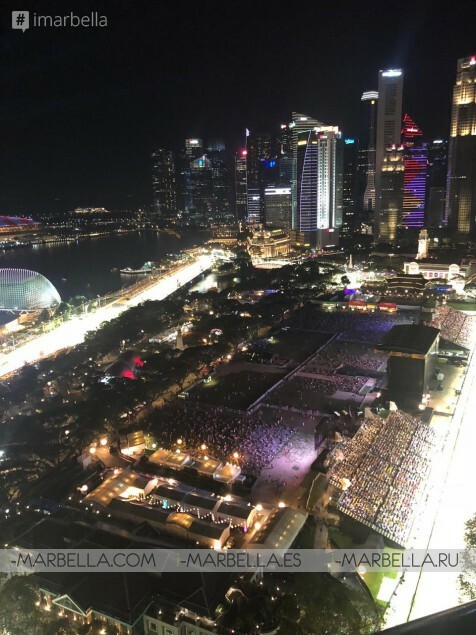 I am silent as I pinch myself, looking out over the illuminated track to the Singapore skyline and the magnificent Marina Bay Sands in front of me. Getting my iPhone out, I record every single second of it as I soak up this euphoric moment. There are actually no words for how I felt up there 30 floors up, apart from the fact that my vertigo was playing havoc with me. Hahahaha I mean, my stomach was literally churning the whole time as it was a sheer drop from the balcony but it was worth it. 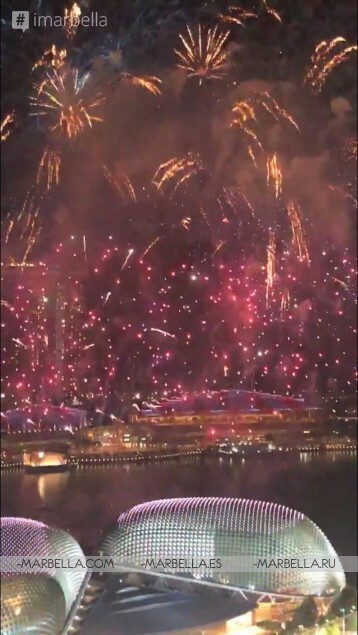 The race is coming to an end and boom the fireworks go off from the Marina Bay. WOW again, just wow.....I look to the cameramen with my mouth open and gasp. They are all smiling at me as we have this absolutely amazing breathtaking experience together. Lewis Hamilton wins again and it's time for another party. This time in the shape of the Amber Lounge, the infamous F1 after party. Singapore certainly knows how to host the F1 and I will definitely be back next year for some more. My two weeks fly by very quickly and I have had the best time ever. 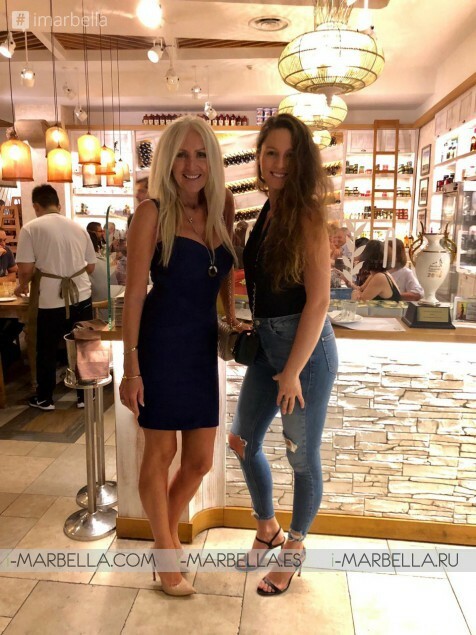 It has been great spending time with my baby girl and it's now time for another couple of days in Dubai again to break up the journey home. Bye, Bye Singapore I love you, I will be back for more.